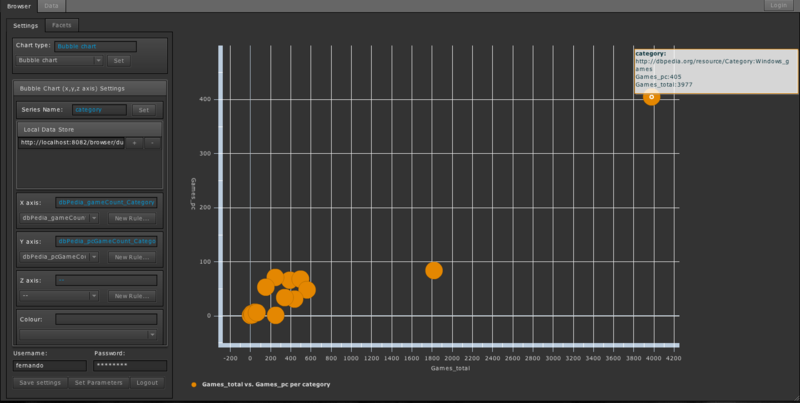 Idea Analyst is a web application that takes distributed data in RDF as an input and allows to plot it into charts. Info: A data visualisatin web app, that grabs RDF and turns it into charts. The application has been written using Adobe Flex framework and uses php backend to store some persistence data like baisc settings, SPARQL rules, data sources etc. Be advised that the available demo is strictly a research proof-of-concept prototype – it lacks a number of functionalities and for the specific use cases described within the Gi2MO homepage we used a a range of custom settings that are available only via source code modification. If you are interested in the use of the tool we recommend the thorough analysis of systems that can be linked with Idea Management for mining metrics or optionally feel free to contact us directly for more information.